Burroughs' writings . . . were numerous, but The Rare Jewel of Christian Contentment is one of the most valuable of them all. Its author was much concerned to promote . 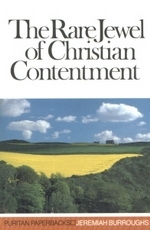 . . peace and contentment in the hearts of individual believers during what he describes as 'sad and sinking times.' It is marked by sanity, clarity, aptness of illustration, and warmth of appeal to the heart.